The East Anglian Children’s Arts Festival, Once Upon a Festival, has two shows for families at the Apex. Graffiti Classics on Monday 13 June at 10am, has 16 strings, 8 dancing feet and 4 voices with just 1 aim - to make classical music wickedly funny and fantastically exhilarating for everyone, young and old. Graffiti Classics bursts the elitist boundaries of the traditional string quartet with its hilarious all-singing, all-dancing musical comedy show. Enjoy a broad spectrum of music from Beethoven to Bluegrass, Bach to Brahms, Strauss to Saturday Night Fever, Offenbach to Elvis as well as many well-loved folk tunes. It’s a classical concert, a gypsy-folk romp, an opera, a stand-up comedy set and a brilliant dance show all rolled into one! Kids and adults alike will love the uplifting variety of musical styles, all tied together with cheeky audience interaction. On Tuesday 14 June at 4.30pm, Compagne Animotion present Portmanteau. Imagine yourself in the 1940s. In rural France. In a travelling cinema. You’ve been invited to a special private showing of a spectacular new film... but, oh no! The projector has broken down! Can the two ushers play all of the characters? Will there be popcorn in the interval? Will our pianist’s fingers catch fire? Be amazed by our ushers' imagination, gasp as our hero disappears into the screen, and laugh with us as moustaches, hats and disguises fly everywhere to tell the story of heroes, heroines and baddies! Experience the glitz and glamour of the movie world after the show with special VIP tickets. Try on costumes, walk the red carpet and have your photo taken by our paparazzi, before sitting down to afternoon tea fit for a film star. Tickets for each show are £7.50. VIP tickets for Portmanteau are £12.50 and include afternoon tea. 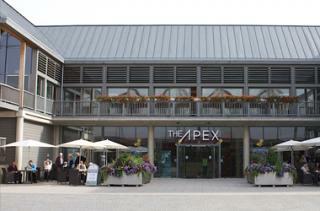 Ring The Apex box office on 01284 758000 or see www.theapex.co.uk for more details or to book.